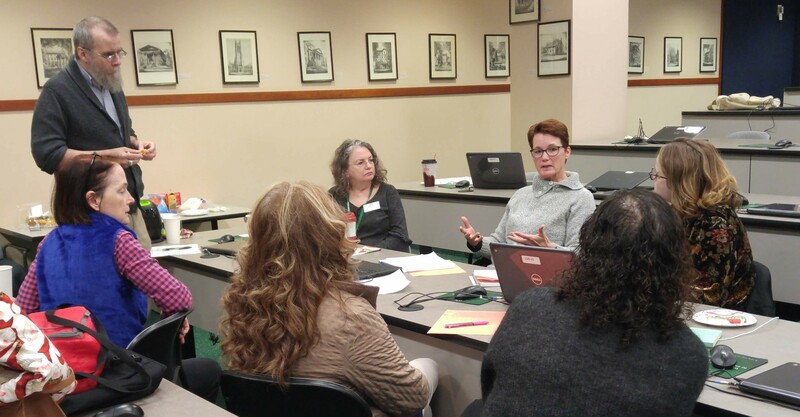 BLINC (Business Librarianship in North Carolina) met for its spring workshop last week Friday. You can’t tell from this lunch-time picture, but the flowering trees are now blooming over here in the NC Piedmont, and the daffodils are up and looking pretty. 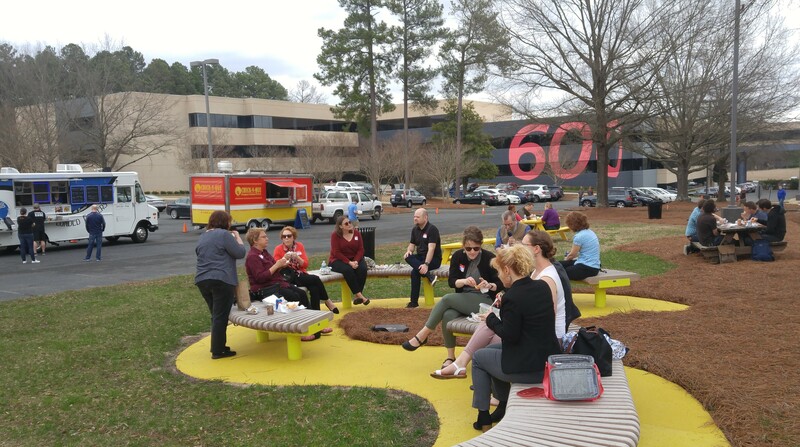 Well, the lack of coats on these business librarians enjoying lunch and networking outdoors is a sign of spring! Around 20 business librarians, public and academic, attended the workshop. We had more public librarians than academic librarians this time, a nice change of pace. Four folks were first-timers at a BLINC workshop. We gave our new friends a special welcome. My notes are somewhat rough since I was also serving as the workshop coordinator, along with fellow-officer Sara Thynne of Alamance Community College. My apologies to the presenters and you readers. After describing a few examples from recent magazines and newspapers, we discussed core aspects of social entrepreneurship. Many of these aspects impact our consulting work with social entrepreneurs. The Sullivan Foundation focuses on rural and micropolitan places in the U.S. south — the kinds of places that often get ignored in discussions of trendy entrepreneurship. Measuring outcomes: assessment or story telling? Dan is helping social entrepreneurs grow their networks and seek funding. Slow money, micro grants, and peer lending is happening in Dan’s rural county. It’s not just Detroit Soup anymore. A business schools are not the most fertile ground for social entrepreneurship — the arts and humanities are. There is much less emphasis on traditional business plan writing [more on that after lunch]. We moved the IRS 990 discussion for after lunch. The Frontier has “Food Truck Rodeos” on Friday, so we went outside and had lunch. That was fun. Easy to network and socialize on foot, and then we munched on benches. Betty Garrison (Elon University) caught a bug and couldn’t make it, so I jumped in to cover this topic. Most of the BLINC friends had experience with the IRS 990 financial forms required for many nonprofits. Using some examples I pulled up from http://foundationcenter.org/find-funding/990-finder, we discussed using these forms for financial benchmarking and strategic insights. Nancy Lovas (UNC Chapel Hill) described the nature of this event and her role in it as the recently-hired entrepreneurship librarian. This is a new but already big event at her campus. https://www.makeathon.unc.edu/ . It lasts a week. Ideas must have a social impact focus. Many non-business students compete. Student teams present either an idea for a physical product or an app (apps are really popular). The teams use the business model canvas for their submissions and 12-minute presentations. Nancy provided research consultations for six of the teams. Nancy has a research guide, https://guides.lib.unc.edu/lean-canvas, organized around the topic boxes of the business model canvas. She also works with the campus’ social entrepreneurship hub, located within the Campus Y.
Nancy led a discussion on the business model canvas versus the business model versus the traditional business plan. 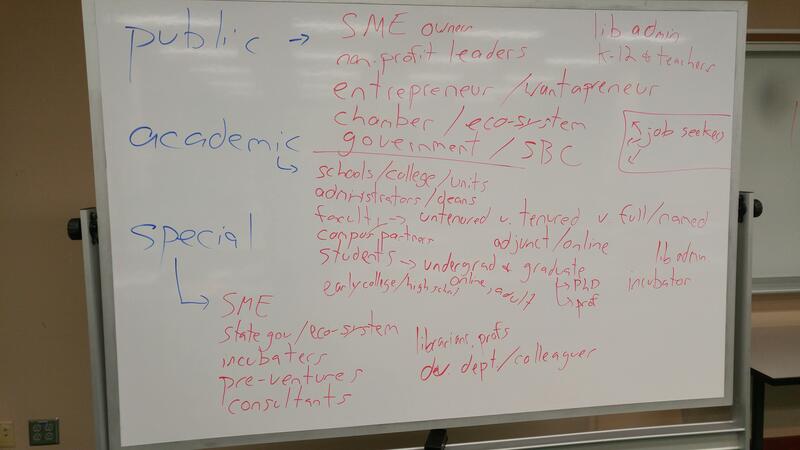 Many of the public librarians hadn’t been exposed to these alternatives to the business plan. Deanna Day (research consultant (and librarian), Small Business and Technology Development Center) discussed how the SBTDC supports social entrepreneurs. SBTDC is the “business and technology extension service of The University of North Carolina” [from that site]. So it covers the whole state through our 16 campuses. Deanna provided some examples of SBTDC’s social entrepreneurship clients. SBTDC councilors also support students working on pitch competitions (I didn’t know that). The councilors’ biggest concern when working with new social entrepreneurship clients: that the clients won’t be able to sustain their business/organization, and that their financial planning is undeveloped. Because funding is difficult to obtain from traditional sources? SBTDC now uses Liveplan, available to their clients. It works well, she reported. Banks and the SBA accept Liveplan reports when they consider making a loan. I talked briefly about Simply Analytics (which we all have access to via NC LIVE), PolicyMap, and Social Explorer as tools for social entrepreneurship. Even though many of us usually turn to Simply Analytics for its deep collection of psychographic data, it has plenty of Census data too, which can easily be ranked by location as well as mapped. Social Explorer is very useful for time series data, since it has data back to the original, 1790 Census. Of course, the data back then was pretty limited in scope. For more recent years, it has data from County Health Rankings and Roadmaps. Happy spring break! Well it’s that magic week at UNCG at least. Sorry I haven’t written here since before the spring semester began. We liaisons are busy people, right? I’ve had more night classes than usual this semester, for both one shot instruction (often graduate classes) plus two of my core embedded classes (for which I had to reduce my roles). I’ve also had some morning classes on the same day as the night classes, so a number of 12-hour days this semester. Tiring. 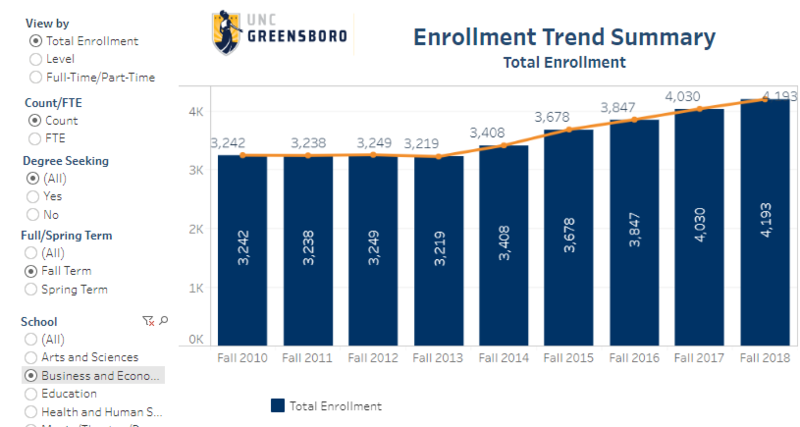 The UNCG School of Human & Health Sciences has also grown a lot, while the Nursing, Arts & Sciences, and Education schools have been declining in enrollment. Interesting trends that will maybe someday have liaison staffing implications here if our subject assignments become partly informed by data? But I have to bear in mind business librarian friends like Ash Faulkner from Ohio State and Min Tong from U. of Central Florida who have over twice as many students in their liaison roles as me. Props to those hard-working professionals working their lean liaison programs. Over 125 folks have filled out the survey my friend Betty Garrison from Elon University and I created on experiences with business librarian organizations. The results including the comments are very interesting and we look forward to writing them up. With Betty’s permission, I might share a few findings and comments from survey here this summer while writing about ACRL 2019 and BLINC programming. BLINC’s spring workshop in mid-March focuses on social entrepreneurship — outreach, services, instruction, and resources. In outreach and teaching opportunities, I’ve been thinking about this more. We are teachers, research consultants, and economic development partners who frequently make first contact with students, professors, deans, entrepreneurs, and/or eco dev leaders. So we need to establish strong, favorable first impressions through delivering a concise, effective sales pitch — we are selling ourselves as liaisons. In the 2018 edition of USASBE’s Annals of Entrepreneurship Education and Pedagogy (sorry, no open access), the lead-off article is “What I’ve Learned about Teaching Entrepreneurship: Perspectives of Five Master Educators”. One of those five “master educators,” Luke Pittaway (Ohio University), wrote of his very mindful work in his classroom before the students show up for the first class session. Some of this mindfulness applies to introducing ourselves as liaisons. Professor Pittaway enters the classroom quite early, turns up the heat (wow I’ve never been in a classroom in which you can control the heat! What a luxury), writes his contact info and class learning objectives on the board, powers up the projector while opening Pandora for some Latin Jazz, and reviews his printouts of the student names and pictures. Finally the students begin to trickle in. Professor Pittaway shakes each student’s hand as they enter the room and chats with many of them about their backgrounds. He asks them to set out their name tags out on the desks (table tents — a stable of MBA education). Finally he begins class not by going through the syllabus but by asking the students about entrepreneurship and getting them to talk and share. Of course, professors and librarians don’t always have that much time before a class begins. Yet this is a good example of trying hard to make a good first impression. Preparing our pitch to answer that question helps us use patron-centered language, as opposed to the language used in our library goals, the ACRL framework, etc. Those documents are written for a different purpose. Meeting a new prof, department head, student, etc. Our pitches need to vary by target audience. In my case, the Geography grad students have very different needs compared to the evening/executive MBA students. Or the PhD students in our Consumer Apparel and Retailing Studies program, the new head of Economics, or the head of our campus entrepreneurship center. Or the Action Greensboro officers working to keep more young professionals in the city. I use this one a lot. Yes, it’s not intellectual. But this message resonates with students. They hear I am on their side. Usually when I say this, I get both eye contact and some head nods from the students. The professor (even if sitting in the back of the room focused on grading) sometimes pipes up with a verbal “Yes!” as confirmation. In my for-credit research class, I have told the students I want them to become “more effective and efficient researchers” and “more comfortable searching for numeric data from datasets.” But those students have already signed up for a 3-credit class on ENT and eco dev research, so they are already pretty crazy umm I mean committed. Sometimes I talk about how employees increasingly want to hire recent graduates with skills in “big data” and “data analytics.” The professors also add a “yes” to this. Perhaps it is a bit of a stretch to use such language regarding skills using ReferenceUSA, SimplyAnalytics, or American FactFinder. But I do anyway. Sometimes after they have used some of the databases, I ask the students to guess the commercial cost of an individual IBIS or Mintel report. Usually the students underestimate the prices at first. I respond “higher, guess again!” until they get close. Then I show the actual cost using marketresearch.com (pulled up before class began). “Information has value!” sez the framework. Emphasize your skills in identifying possible datasets they could use, teaching citation management software, and conducting citation analysis to identify seminal works and the core authors. Here is an email template I use each summer. I haven’t looked at this since last summer. It would be more interesting if I worked in something specific about the prof, like their teaching or research focus. While budgets may be tight, you can certainly pursue acquiring datasets and other resources the new prof might need for their own research agenda. Some of these liaison pitches could certainly be improved. I hope you found the examples interesting and are thinking about your own pitches. A vendor recently told me that I would be good in sales (she may have been buttering me up). I replied that sales is part of being a liaison — we just call it outreach. Snow day today! We got about 18 inches on Sunday. Campus will probably be closed on Tuesday too, although the snow is melting pretty fast. At its August workshop, BLINC (Business Librarianship in North Carolina) focused on ReferenceUSA and Proquest business content. Both products are available state-wide through NC LIVE. InfoUSA’s David Turner, an old friend of BLINC, came over from Omaha. New friend Jo-Anne Hogan, ProQuest business content manager, came down from London, Ontario. David and Jo-Anne talked to us about their new content, their third-party data acquisition process, and interface issues and options. The librarians asked many questions and made a number of suggestions. That was basically it for the workshop agenda. For our December workshop last week Wednesday, BLINC returned to its roots: sharing, networking, and learning from each other. 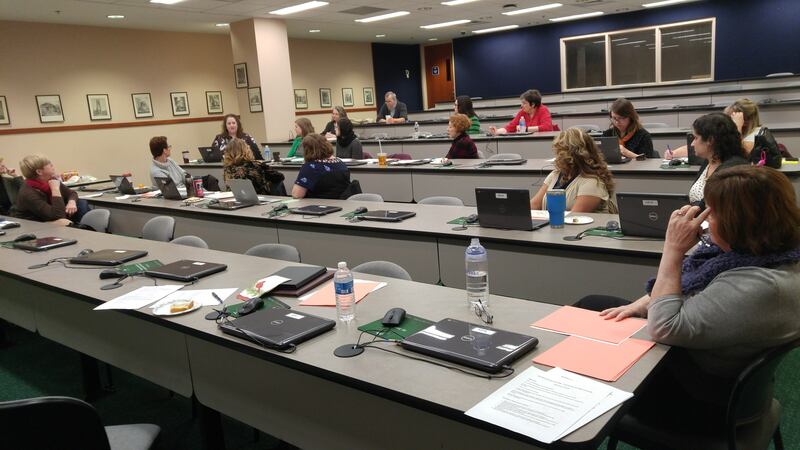 We met in Atkins Library at UNC Charlotte, courtesy of UNCC Business Librarian Nicole Spoor. BLINC planned this workshop with Carolinas SLA. There were five special librarians present along with 15 public and academic librarians. Having those special librarians aboard enriched our discussion. 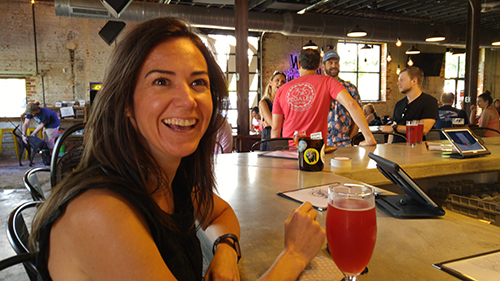 We welcomed several first-time attendees at a BLINC workshop, including one MLS student. Sara Thynne (Alamance Community College) and Betty Garrison (Elon U.) summarized the instruction sessions at the BLINC/CABAL workshop from last summer. Both Sara and Betty were speakers at that event. 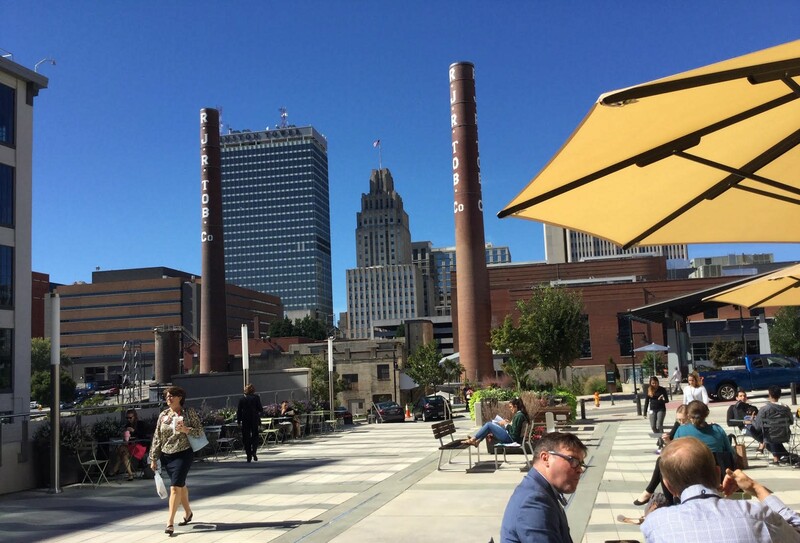 Beth Scarborough (UNC Charlotte) described her experience at the ReferenceUSA User Conference, and what she learned about how InfoUSA collects and verifies its data. We also asked Susie Corbett, Vice President, Library and Information Technology, of the North Carolina Biotechnology Center, to tell us more about her interesting institution (a “public-funded private non-profit”) and the drug pipeline and venture capital databases she and her team use in their information center. Both the public and academic librarians thought this was very interesting. To whom are we selling ourselves? How can we align our messages with our organizational priorities? Formats of outreach: in person, email, social media, print, meetings, events? Pros and cons of each? Stories of successful outreach you can share? Not so successful stories, or still in progress? How do we measure success or outcomes in selling ourselves? How can leverage the special powers of introverts toward effective outreach? We began our discussion with the first question, using a big white board to segment our markets. So the first step: identify your different targets or types of customers for outreach. Most of those groups have different needs. So your outreach message and strategy need to be customized for each group. Some overlap in groups, as we expected. We get pretty nuanced. For example, MBA and PhD students have some pretty different needs. For any campus that has diverse graduate programs, generalizing about the needs of graduate students (“our grad students need this…grad students want that…”) isn’t a very thoughtful or effective way to support them. After developing those lists as a big group, we broke into small groups by type of library: special, public, academic. We had about 25 minutes for the break-outs. Each team wanted to talk longer, but I was a meanie and asked them to come back into the big group for our summary of small group thoughts before lunch time. I didn’t take notes when we reassembled as a big group to share key points from the break outs, I’m sorry. I was standing down in front of the classroom moderating the discussion. Attendees thought our outreach discussion that morning was very useful but could have used more time. Lesson learned. We could have budgeted an hour after lunch to continue discussing outreach, but there were other topics we wanted to talk about too (and a couple of time-sensitive requests from NC LIVE and NCLA). Hopefully in our 2019 workshops, we will build on what we started at UNC Charlotte. The latest hurricane moved through North Carolina Thursday afternoon. I had a fun 9:30am research workshop for an investments class (and most of the 48 students were there!) but we learned then that classes would be cancelled at 2pm. Three big trees were down on the highway between Greensboro and Winston-Salem on my way home in mid-afternoon. Our region had localized flooding and power outages, but no deaths. Several speakers at the conference were unable to get to Winston-Salem (including the morning keynote, who had to provide his talk online). As mentioned here in 2014 and 2016, this is not a conference about entrepreneurship librarianship, although a few business librarians usually attend each year. “Entrepreneurial” in the conference’s name is defined as “innovation”, so the topics of the speakers and discussions are broad. As an attendee, I focused on supporting as many of the business librarian speakers as I could. One of those business librarians was Ash Faulkner, whom Carol and I joined for dinner downtown Thursday night. The sun came out an hour before sunset. A financial planner told Ash that she could expect to retire in 2055. In this discussion-oriented program, Ash explored trends in librarianship and the workforce in general to guess what the nature of her career might look like up to its end. Some of the discussion was on near-future trends but it was interesting speculating on the long term possibilities. Kassie and John are BLINC friends whose outreach and consulting work at the High Point Public Library have always been impressive. They discussed their library’s proactive engagement with the local business and nonprofit community, inspired by the embedded librarian model of reference service. The business librarians promote the development of ongoing, productive relationships between the library and its customers. Getting out of the library to build relationships with clients is key. “We need to leave the library and show the community what a powerful tool we are,” John advocates. This embedded work is the library’s response to the city’s strategic plan, which promotes entrepreneurship city-wide but with emphasis on downtown. The library also created a dedicated business center in the library for training and hosting local organizations. The library has partnered with many local organizations supporting entrepreneurship, economic development, and nonprofits. The librarians now help steer entrepreneurship to relevant support groups. The library had a preliminary goal of 12 client consultations a year, but now averages around 150 per year. 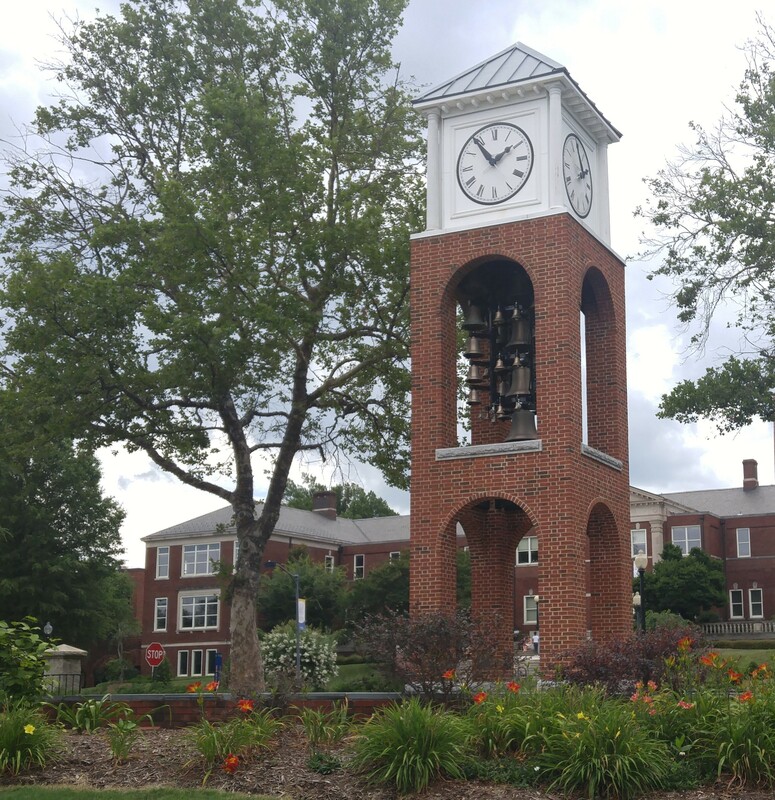 The librarians use NC LIVE databases (such as ReferenceUSA and SimplyAnalytics) and High Point GIS data, but also provide some tech training, such as basics of using social media. Some clients want to learn how to use the databases themselves, so the librarians are trainers as well as research consultants. Kassie and John provided several happy customer testimonials and some examples of research projects. One example: when the city tore up Main Street for a long, comprehensive utilities rebuild, the library organized downtown businesses to collect feedback and complaints about the road closure, and to help those businesses promote that they were still open for business. Now another chunk of downtown will be ripped up to build a new minor league baseball park. The city asked the library to repeat those coordinating services for that neighborhood. State legislators are also hearing about the library’s business and nonprofit outreach. Really good stuff – high impact and progressive. Kudos to Kassie and John (and their former colleague Vicki Johnson) for their excellent work, but also to library leadership for funding these positions and the business center. My colleagues Amy and Maggie discussed their recent outreach and programming to groups outside of the university. With implications for liaison work (and workloads), they discussed how to prioritize such outreach, and balance “departmental work with our core constituents with community outreach”. They also presented a SOAR (strengths, opportunities, aspirations, results) analysis for evaluating the impact of the work. 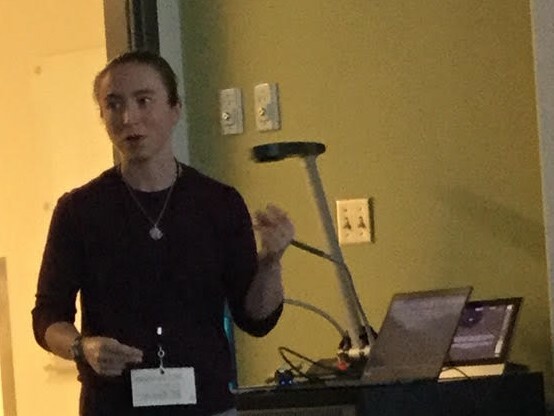 My colleague Sam followed up with a description of a community engagement project she implemented along with Lea Leininger, the UNCG Health Sciences Librarian. They have provided 5 workshops so far. Challenges include communicating the medical terminology, dealing with different levels of technology, assessing the workshops, and participation. The opening keynote speaker was Patrick Sweeney, Political Director for EveryLibrary, the only PAC for supporting libraries. I didn’t know anything about this organization. He challenged our traditions of feel-good marketing (all those ALA posters) and instead asserted that the goal of advocacy is driving public library supports to action – doing something (donating money, fundraising, or voting). He asserted that libraries need to use data analytics on its financial and voting supporters and make decisions based on that data. Libraries need to understand their communities – demographics, lifestyles, and attitudes/politics [there’s the business librarianship connection] – and craft their messages to match, not just speak from a librarian echo chamber. Timothy Owen, Assistant Librarian for the State of North Carolina, discussed telling stories. He also provided examples of problems in data visualization and asked us to figure out what was going on. Summer ends early when you work at UNC Greensboro. We are already two weeks of classes into the fall semester. This fall, all three of my embedded classes feature significant changes. Perhaps the biggest change is with ENT 300, a feasibility analysis (pre-business plan) class required of all Entrepreneurship majors and minors and all Arts Administration majors. This is a team-based, research-intensive class in which the students create a major report to decide if a business or nonprofit idea should move forward to the business plan phase. MBA 741, the capstone course Orolando Duffus wrote about a few years ago, has a new professor, Dr. Beitler. But after two evening classes so far, the nature of this class is very similar and my role (based on Orolando’s successful embedded work) is unchanged. The third class is MKT 426: International Marketing, the oldest ongoing story at this blog. 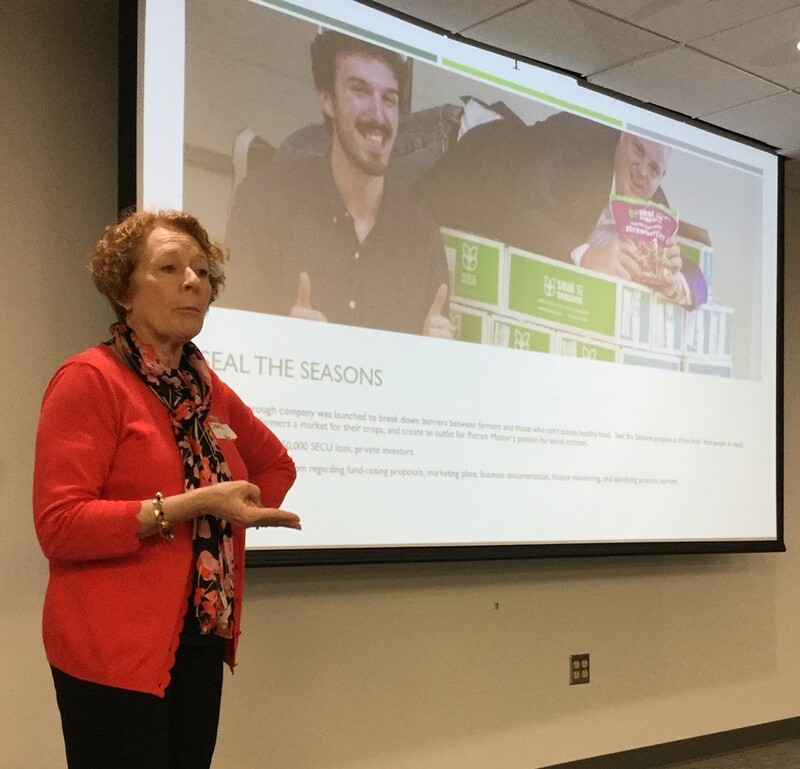 The class is dominated by Export Odyssey, an exports promotion and experiential learning project in which the student teams try to make a sale to a new country market for a North Carolina manufacture. Working closely with this class was my first embedded librarian role. The class helped me gain teaching experience that I couldn’t get from one-shot instruction and also helped me get involved in the local economic development ecosystem. And it was a lot of fun although also at times challenging and always time consuming. Collaborating with Professor Williamson gave me confidence to pursue other embedded opportunities, such as getting involved with cross-campus entrepreneurship. The rest of this post updates the story of this embedded role. I’ll also touch on workload and sustainability – issues always behind the scenes in embedded work. 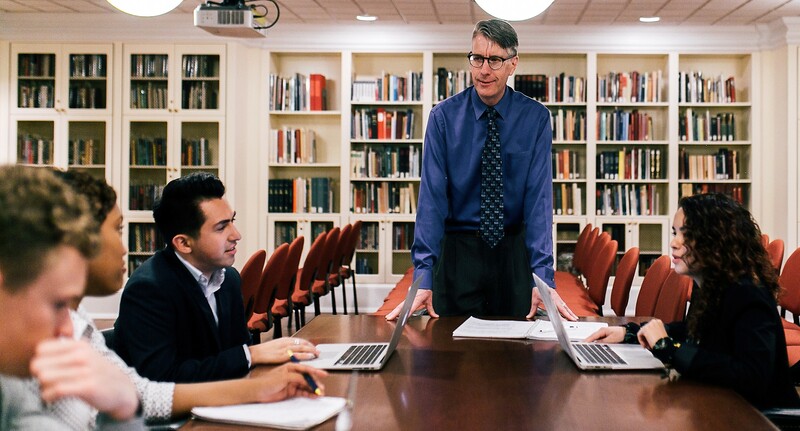 Last year, I wrote about Professor Williamson wrapping up his phased retirement, and the hiring of the new international marketing professor, Dr. Bahadir. We made the adjustment of working together as co-teachers. We also like each other. But it is a different relationship than I had with Professor Williamson. It would have to be because the professors are different people. Professor Bahadir teaches more Export Odyssey research methodology than Professor Williamson did. So I’m not formally teaching as much as I used to in class. I miss that a little. But he is the professor of record on the syllabus, and he feels responsible to know all the Export Odyssey material. He learned all that very quickly. I used to put so much time into this class (including research consultations, team counseling, and consoling upset students). So being able to adjust my role and the workload in this project has been nice. This fall there are now two 75-minute sections with a 15-minute break in between. So an almost 3-hour time commitment to this class each Tuesday and Thursday afternoon. For past ten years or so, there was only one section. Professor Bahadir recognized how time consuming it is for the student teams to recruit their own manufacturers. We give them four weeks to do that at the beginning of the semester, limiting the time the teams have to develop their export marketing strategies. So Professor Bahadir asked if we could pre-recruit manufacturers to assign to student teams. Through partnering with Professor Williamson, I had met officials from several export promotion agencies. I began inviting those folks to have lunch or coffee with Professor Bahadir and me to see if their agencies could help recruit interested manufacturers. We ended up talking to representatives of the U.S. Department of Commerce (the local office), Small Business and Technology Development Center (SBTDC, a UNC system organization), the Triad Regional Export Initiative (a grant-funded local organization on whose advisory board I serve) and some folks from state government. I enjoyed introducing everyone at those lunches. We did end up with four student teams out of ten working with companies recruited from the SBTDC. The SBTDC became part of the support network of those teams, and attended class a few times. We hope to have more pre-selected companies in the future. Professor Bahadir is coordinating this work now that he had met everyone. 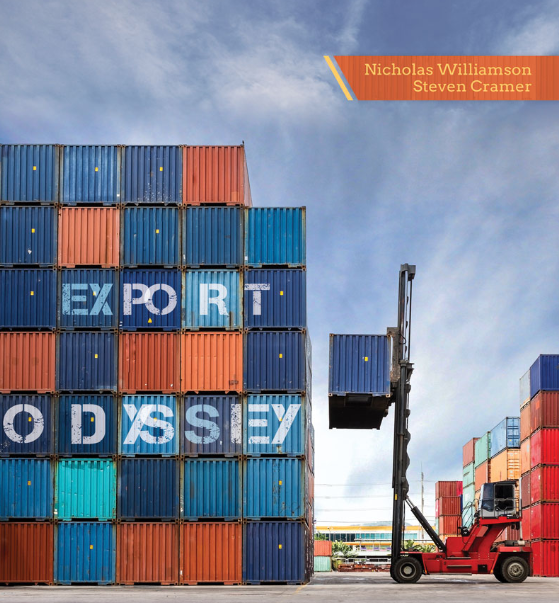 This summer, Kendall Hunt published the Export Odyssey textbook. Professor Williamson and I used to create a home-made project textbook for the students that the UNCG bookstore printed and packaged like a course pack. Through some other professors in the business school, Professor Williamson learned that Kendall Hunt was interested in new content. We pitched the idea to KH’s local rep and they agreed. We spent nine months updating and improving it. We had to rewrite the book to accommodate non-UNCG audiences. I cut out most of the references to commercial databases in favor of free sources (mostly .gov sources like export.gov) with the exception of ReferenceUSA. We also greatly improved (IMO) coverage of the 4 P’s in the context of export marketing and provided updated case studies. The plan was to sell the book as an e-textbook for $50. I liked the cheap price. Alas, the price has gone up already. So much for affordability as a selling point. The MKT 426 students are using the new textbook this fall. A few professors from other campuses are apparently peer-reviewing it. We will see if any other international marketing classes pick it up. And then see what the feedback is. Final story today. 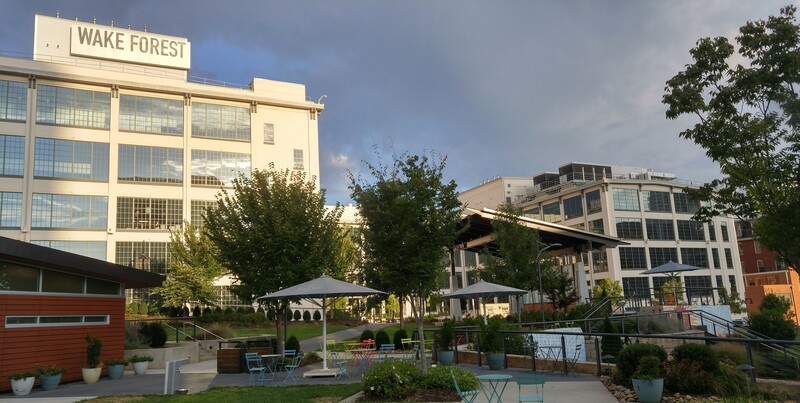 In May, the communications department of the UNCG business school was finishing up an invited article about Export Odyssey for BizEd, the magazine of AACSB International (accrediting body for business schools). The magazine wanted to include a picture of the instructors and some students. So we invited some students from the teams that worked with SBTDC-recruited companies. We also wanted an attractive location for the photoshoot, so instead of the business school, we ended up…in the library’s Special Collections reading room, ha. The campus photographer took a zillion pictures, as they tend to do at photoshoots. You can see the one that BizEd decided to run at the article, but above are two rejects I liked (although I look kind of inebriated in the group portrait?) The diversity of those students is pretty typical for UNCG – we are almost a majority-minority campus. Most of the students were about to graduate, so they were a little giddy that afternoon. Professor Bahadir and I enjoyed that symbolic wrapup of the project. It was the end of our first year working together on Export Odyssey and it went pretty well. Vanessa, thank you for the suggestion. Sorry I used a different title, though. Didn’t sleep well, so a lame start to the day. Sunny and hot already. Put on new dress shoes to start breaking them in for the fall semester. Traffic not bad. Learned that a Charleston Conference proposal I submitted with Orolando Duffus (U. of Houston) and Rosalind Tedford (Wake Forest U.) was accepted. Yay. It will be a “lively discussion” (one of this conference’s program formats) on liaison trends. Should be fun. Right heel starting to hurt. Prepared a bit for next week’s BLINC workshop at Elon University. Got caught up on emails. Reviewed my notes from Thursday’s liaison teams retreat. Scheduled a chat with Kelsey Molseed, a former intern and mentee, for late afternoon today in downtown Winston-Salem, where she also lives. Kelsey has just finished her MLS and had been interviewing. Drove from campus to our downtown Nursing school building (easy parking), then walked a half mile to a downtown Mediterranean restaurant to have lunch with the new business librarian at the Greensboro Public Library, Morgan Ritchie-Baum. Morgan is also a new member of BLINC. I ordered a new-to-me wrap that included strips of dried beef. Ended up with some of it stuck in my throat and had to retire to the bathroom to cough it out. Very embarrassing. But Morgan was super-polite. She is already getting involved with the local entrepreneurial and nonprofit ecosystems. After lunch, we walked a few blocks south and I gave Morgan a quick tour of HQ Greensboro (an incubator space — UNCG is an institutional member). On the sidewalk, we bumped into a former reference intern, Melanie Knier, who also took my old business information class. She opened a vintage apparel shop in the neighborhood. Back in the office. Took off shoes. Oh look, I had a blister which popped and then bled through my dress sock. Yuck. Applied Neosporin and band-aids. Switched to my hiking shoes with thick short socks. Heel feels much better in them. Considered changing shirts for the 4pm chat with Kelsey. Notice the new knit shirt I’ve been wearing today had a tear along the seam in the armpit area. Lovely. Met Kelsey in a coffee shop and we had a nice chat. She just received two job offers (from a small school and a big school) and had to make a tough decision. We talked about that and other things for a while. She moves away next month. Hopefully we’ll meet again at a conference sometime soon. Read a book in a brewery (not the one Vanessa I visited yesterday), then played some pinball in the retro arcade. Chatted with barkeep Cheyanne before heading home to see my wonderful wife Carol and ask her how her day went. Made dinner together and talked about looking forward to playing with the little nephews on Saturday at a family pool party. Slept much better that night. I continue to work on summer projects, but this week finally started to dip into a folder full of readings that date back to last fall. Below are summaries and some comments on articles, blog posts, and conference presentations concerning teaching and business librarianship. All of these readings are open access (except the one from the Journal of the Academy of Business Education, which is available in ProQuest and Ebsco). MBAA is a business administration academic conference that meets each spring in Chicago. 900 folks attended in 2017. Cara is a business librarian from Grand Valley State University (who did a good program at LOEX in 2016). She summarizes the programming and support for research and publishing offered by this conference. Do check out the slides, which approach the issue from both business education and librarianship perspectives. You can tell from the slides how Cara was teaching the MBAA profs about our take on information literacy. Thank you, Cara, for promoting the value of business librarians at this academic conference. Speaking our language: Using disciplinary frameworks to identify shared outcomes for student success in college … AND BEYOND! Rebecca is from Temple University, Kathy from Wake Forest University. Both are subject liaisons. I would have certainly attended this one if I had gone to LOEX in Houston this year. Don’t overlook the notes to the slides. Do you remember what popular movie “…AND BEYOND!” comes from? The initial communication problem of those two co-stars was a result of two different mindsets (being a real spaceman v. being a toy), which Kathy compared to talking “to disciplinary faculty about information literacy” from a library mindset. Understanding a disciplinary mindset regarding IL helps up perform more effectively as liaisons. So liaisons need to use the language of the discipline to help develop “higher order critical thinking skills among undergraduate students.” The next part of their presentation discusses disciplinary frameworks (with a link to the ACRL list) and connects those frameworks with the ACRL Framework (ex. slide 14 notes). Case studies follow. The Framework, like the old Standards, seem to me too focused on using scholarly literature, other types of articles, and evaluating web pages (article-like content). Those content areas aren’t relevant for the majority of teaching I do, in which the students are using specialized content (including lots of numeric data and other structured data, like company lists) to solve problems in their communities. I’ve seen some attempts to apply all the Frameworks to business research, and sometimes the suggested active learning activities seem irrelevant to business research needs. It’s easier to do this with more social sciencey disciplines like Economics and Geography. Something I need to think more about. Three short articles by public, academic, and special librarians (published under the above title) on the state of IL in those three different environments. This piece provides a good summary for those new to business librarianship, but also some benchmarks for more veteran librarians. Show this to your boss if he/she doesn’t understand your work or operating environment as a business librarian. Chad discussed how the last time he taught this class, the students focused on learning the databases, but didn’t do much thinking about how they could use their research findings to make decisions and solve problems with their proposed business. (See some of Ilana Stonebraker’s writing about problem solving being the ideal goal of research instruction and IL.) Chad ended up having to provide many consultations with student teams regarding using their research. The next time he taught these sections, Chad had the student teams watch database video tutorials and then answer questions using database content. Through answering the questions, the students learned more about understanding the content and applying it to a business idea. Chad still had many consultations with teams after the workshop, but the consults tended to focus on the business ideas and how to support them, not just database training. Much more lesson planning details in Chad’s post. I always enjoying reading detailed accounts of a lesson plan for interesting research assignments! The authors are faculty at La Salle University. They surveyed students in an introductory business class and “found that performance features, along with ease of use, were primary factors influencing database selection.” The authors didn’t apparently work with a librarian on this project (see below for such a research partnership) but do refer to librarians several times in this long research article and cite some library science journals. However, the idea of librarians proactively supporting research and classes is not mentioned. The article opens with a lit review on millennials’ digital behavior. The introductory class is taken by all first-year students in the business school, who work in teams to develop a business plan over 16 weeks. That’s an interesting choice. I think most entrepreneurship educators would recommend having new/young students first learn to develop a business model. But writing a business plan in this class does get the students into using research for problem solving (one of Liu’s trends in business education, see above). In each class session, the students view PowerPoint slides that link to one of 17 “online databases” to use to research their business idea. Table 1 identifies the databases – mostly free sites, some not normally defined as a database, like the Johnson & Johnson homepage (? ), but also Mintel, MarketLine and Capital IQ. Some of the more complex databases like Capital IQ were demonstrated in class by the instructors. The article’s theoretical discussion explores students’ preference for using a small number of search engines that they are familiar with, and discusses other information seeking behavior. The authors surveyed 141 students from several sections of the class near the end of the semester and had a 55.3% response rate. Students were asked to rate the usefulness, ease of use, and intention to use each database in the future. J&J, MarketLine, Monster, UPS, and Mintel were deemed “easy to use” by over 50% of the students. The research/library databases scored well for “intended to use in the future”, despite being new to most of the students and more challenging to use. Nice to learn. The authors note this as one of several pleasant surprises from the findings. The discussion provides strategies to encourage student success with databases. Being extra responsive to first year students is one suggestion. Introducing new databases relevant to current research needs in class is another. The authors caution that a longitudinal study is needed to learn if students do continue to use databases introduced in this class. Elizabeth is the Science & Social Sciences Librarian at Portland State University. She writes about collaborating with a professor on IL instruction in an asynchronous, online class. She also provides recommendations for creating such partnerships. Elizabeth relates successes and frustrations getting students to agree to participate in the student. Working with a second instructor of this class proved to be a challenge. (Given the nature of this journal, its articles tend to go into great detail about relationships and communication. Editorial emphasis I’m sure.) In the first professor’s sections, Elizabeth’s contributions paid off for both the students and the professor. Other professors in the department learned of the collaboration and project and were interested in and enthusiastic about the results.